The hand-cranked H.L. 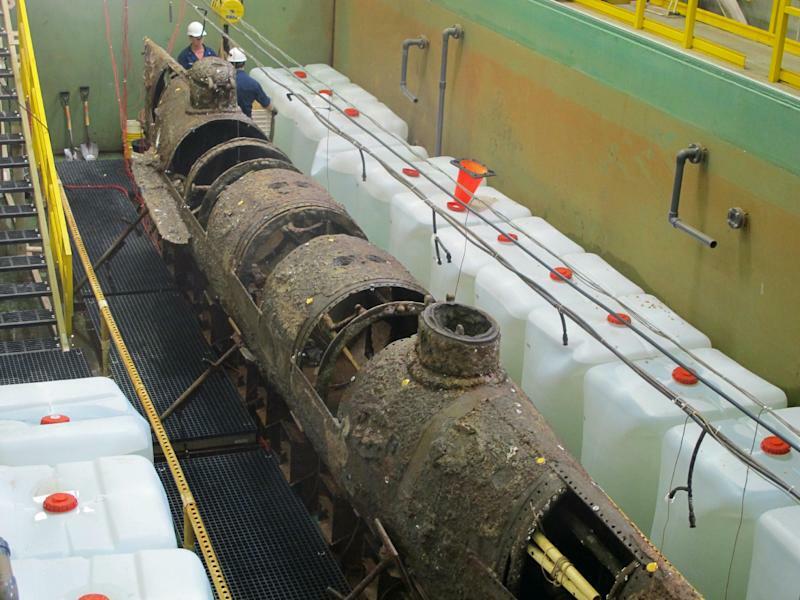 Hunley — which rests in a 76,000-gallon conservation tank — will be treated with a solution of sodium hydroxide for about three months to loosen the encrustation coating the hull and interior of the sub. Conservationists will drain the tank each day and later, wearing protective gear, use hand tools to remove the hard sand, sediment and rust coating the sub before refilling the tank each evening. Removing the encrustation will reveal the original surface of the hull and with it any damage that could yield new clues to its sinking off Charleston, S.C., in February 1864. The war had begun with the bombardment of Fort Sumter in Charleston Harbor three years earlier. The sub and its crew of eight had set off a powder charge that sank the Union blockade ship USS Housatonic as the Confederacy tried to break a Union blockade of Charleston. But the Hunley never returned and just why remains a mystery. The wreck was discovered off the coast in 1995. Five years later, in August of 2000, cannons boomed, church bells rang and thousands watched from the harborside as the 40-foot-long sub was raised and brought by barge to the conservation lab. The silt-filled interior of the sub was later excavated and the remains of the crewmen removed. In April of 2004, thousands of men in Confederate gray and Union blue walked in a procession with the crew's coffins from Charleston's waterfront Battery to Magnolia Cemetery in what has been called the last Confederate funeral. Last year, scientists announced it appears the charge that sank the Houstonic was attached to the 16-foot spar at the front of the sub. That could mean the crew was knocked unconscious by the explosion and died before awakening. A closer look at the hull may provide clues. "Chiseling away the concretion will allow us to travel back in time, potentially helping us learn what happened to the Hunley and her crew that night," Lt. Gov. Glenn McConnell, the chairman of the South Carolina Hunley Commission, said in a statement. When the Hunley was raised, historians thought it was farther away from the Housatonic and speculated the crew ran out of air before they could crank the submarine back to the coast. Gonzalez-Pereyra said while the encrustation on the hull should be removed in a year, the sub will have to soak in the chemical bath for at least four more years to remove salts in the metal and prevent further corrosion of the sub. 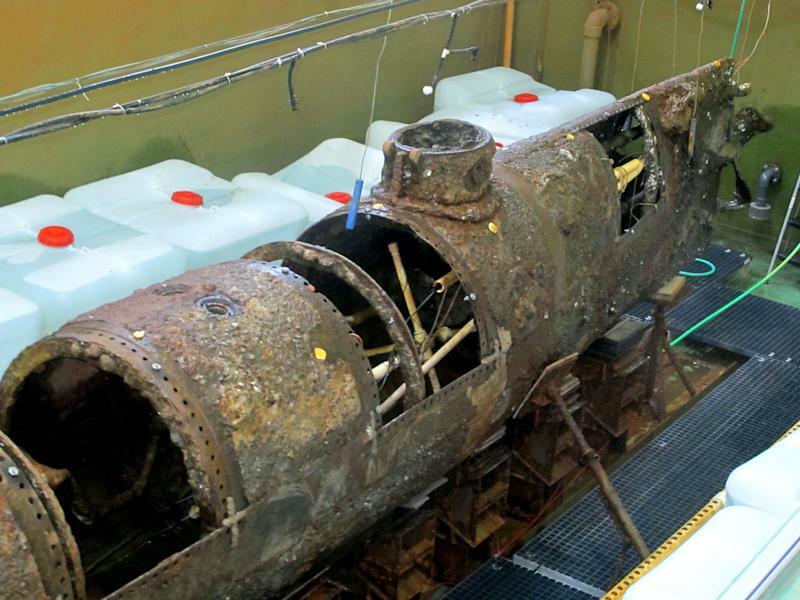 Eventually the Hunley will be put on display in a new museum in North Charleston not far from the conservation lab.